I dont know much about the North American Union with its Ameros and all that hysteria. But what about it scares you guys so much? Is it supposed to be our version of the EU? How has Europe been destroyed by the Euro and the EU? Whoaaaaah - I didn't like the part about Spanish language. Damn, karfar! I got an infraction just for calling someone an idiot ! No worries, that happened to me once too! To me it has nothing to do with immigrants per sec, as they are in the same boat we all are in. It has to do with losing any semblance of control over our economic destiny. I don't know if there is a formal plan for a NAU, but the multinationals are moving in that direction - making us all economic serfs under their dominion. 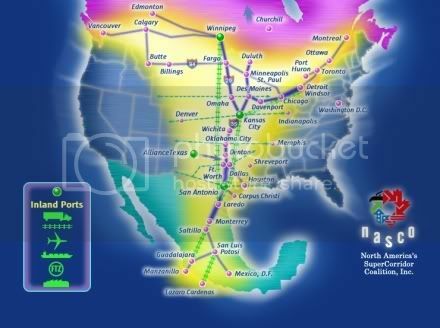 It's imagined to be 300 yards wide with 6 lanes in each direction, separate truck lanes, oil and gas pipelines in the median and a SOVEREIGN Mexican SmartPort in Kansas City! Welcome to the NAU... Got Ameros??? Agree with you as usual Andreabeth but I have to wait before I can give you another Rep.